Light-weight, high performance URL object implementation for Python. mxURL™ provides a new easy to use, fast and light-weight builtin datatype URL for storing and manipulating Universal Resource Locators (URLs), as well as a few helpers related to URL building, encoding and decoding. The new type supports the common tasks of URL joining and gives direct access to the various URL components. It also provides methods for rebuilding URLs, e.g. replacing the host or just the scheme in an existing URL. All this is coded in C to give you the fastest possible performance for these everyday web application operations. Easy URL rebuilding (replacing just parts of a URL). Fast access to URL components. mxURL is written in a very portable way and works on pretty much all platforms where you can compile Python. 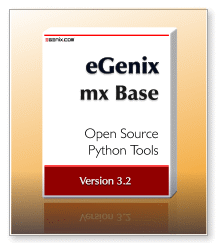 mxURL is provided as part of the eGenix.com mx Base Distribution. Please see the mx Base Distribution page for details regarding the license. The PDF file is also available as part of the installation and can be found in the mx/URL/Doc/ folder. mxURL is provided as part of the eGenix.com mx Base Distribution. Please see the mx Base Distribution page for downloads and installation instructions. mxURL was originally written for the eGenix.com Application Server. It has since been used in many web applications and application servers that we written for internal use, as well as for clients.